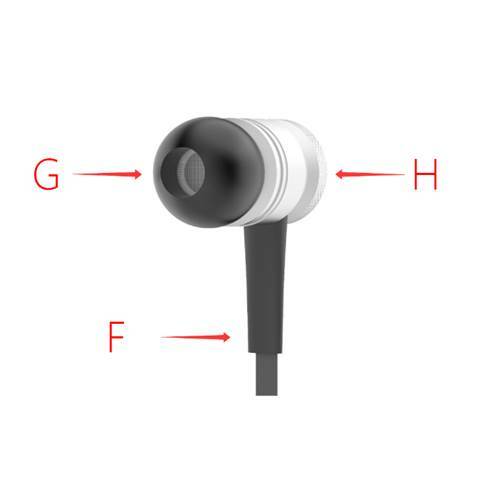 JAKCOM WE2 wearable Bluetooth earphone is a kind of magnetic Bluetooth earphone which can be worn on neck or wrist if not used; its three buttons on the control wire can control music, phone calls or smart voicing assistant. Long press the central button (B point in the figure) on the control wire for 3 seconds to start up or shut down. Earphone will automatically connect the last successfully-paired playing device every time it starts up. If playing device needs to be changed, please repeat the above-mentioned pairing method. When there is an incoming call, short press the central button (B point in the figure) on the control wire once to pick it up. When cellphone is receiving a phone call, short press the central button (B point in the figure) on the control wire once to hang it up. When there is an incoming call, earphone will automatically voice its phone number. Short press the central button (B point in the figure) on the control wire two times to automatically dial last phone number in recent calls. 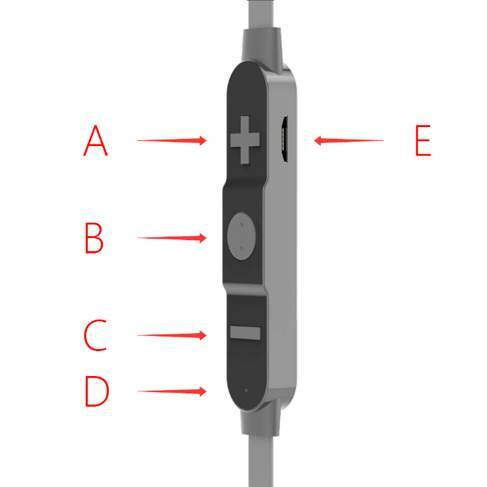 Short press the central button (B point in the figure) on the control wire three times to initiate cellphone built-in smart voice assistant, then speak out your order directly (supporting most brand cellphones with iOS or Android system, such as, Apple, Samsung). Long press the central button (B point in the figure) on the control wire for 5 seconds, the indicator light will flash alternatively with red and blue color, then short press the central button (B point in the figure) on the control wire two times to switch prompt tone language to Chinese or English (Bluetooth pairing with playing device needs to be done anew after this operation). Insert Micro USB charging line in the accessories into the charging socket (E point in the figure) on the right side of the control wire and connect with any USB charging plug to start charging; the indicator light being red means charging is ongoing, blue color means charging is finished; low battery will be prompted for you via voice. If not used, earphone can be hang on neck or wound on wrist, then contact the bottom (H point in the figure) of left and right part of earphone with each other to make them come together. 3. If product inside is drenched or becomes damp, please keep it in ventilated places until it is fully dried for later start-up. 1. Bluetooth is already connected, but the sound still comes from speaker of cellphone or computer itself. Check whether the audio output pattern of cellphone or computer is Bluetooth or not. Sometimes, although Bluetooth is connected, the default audio output pattern of some cellphones or computers is still local, manual selection is needed. If there are multiple Bluetooth earphones or loudspeakers in your home, please confirm whether the device connected with Bluetooth is correct or not. Please check the audio files played and try other ones for testing. Pay attention to avoid unduly long Bluetooth connection distance, or avoid other wireless device with 2.4GHz nearby, or try to move ambient metal objects. All these factors may interfere Bluetooth transmission. When the signal is not good enough, the phenomenon of intermittent sound happens. 3. This user manual is printed in batch and can’t be real-time updated. If above content can’t help your usage, please use the link http://ins.JAKCOM.com to look up the latest usage instructions, common questions and answers or contact our customer service staff, we will respond to you as soon as possible.